The experience of visiting Stonehenge has been transformed and greatly improved. The time it takes to visit Stonehenge and the new visitor centre is also much longer, at around 2 hours which is at least twice as long as previous years. 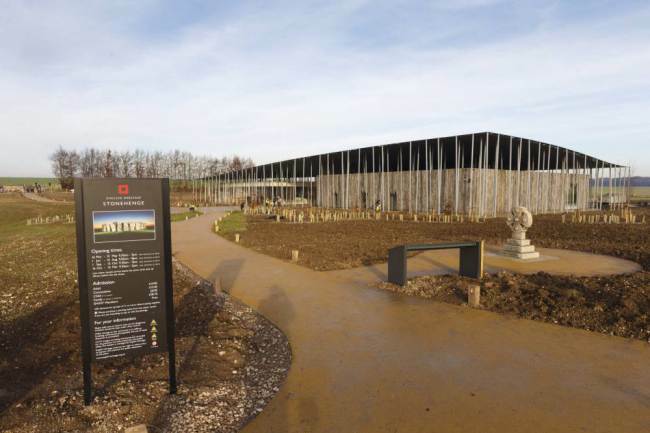 The reason for this radical change is the building of a brand new visitor centre where you start your visit just over 1 mile from the Stonehenge monument. Before you parked adjacent to Stonehenge and walked directly into the monument using the old tunnel. For such a visited monument, facilities before 2014 were an embarrassment. Just a small gift shop far too small for the numbers visiting, turnstiles and toilets in portable buildings and no exhibition or educational facilities. An audio guide provided was your only way of making sense of what you saw before you. From February 1st 2014 you have to pre-purchase tickets in advance from Stonehenge. Advance booking is the only way to guarantee entry on the day and at the time of your choice. English Heritage Members MUST also book in advance using the same link. The reason for this is that you need to book your timed slot on the shuttle between the visitor centre and Stonehenge. During normal opening hours you cannot walk up to the stones. The nearest you will get to the stones is about 15 yards, the monument is roped off by a low barrier. However it is possible to walk up to and among the stones at Stonehenge outside public opening hours. These are called Special Access visits. During these sessions of one hour duration, only a handful of people are allowed into Stonehenge going beyond the barriers and walking amongst the stones. The Special Access Visits are also immensely popular, demand far outstrips supply and they are often sold out many months in advance. Private guided Stonehenge access tours from London, Bath or Salisbury can sometimes be arranged for families and small groups.